It's now pretty common to find motorhomes, and even smaller camping trailers, that transform and expand to increase the amount of living space inside. But the Wider yacht is the first seaborne vessel that features an expanding mid-section to increase its usable deck space, and provide easier access to the water. It's almost as if the Wider 42 gains an extra balcony on each side, complete with extending floats so that the yacht doesn't lean to one side or the other as riders walk back and forth. But unlike something like a motorhome, the Wider's living quarters aren't increased when it does its transformation. 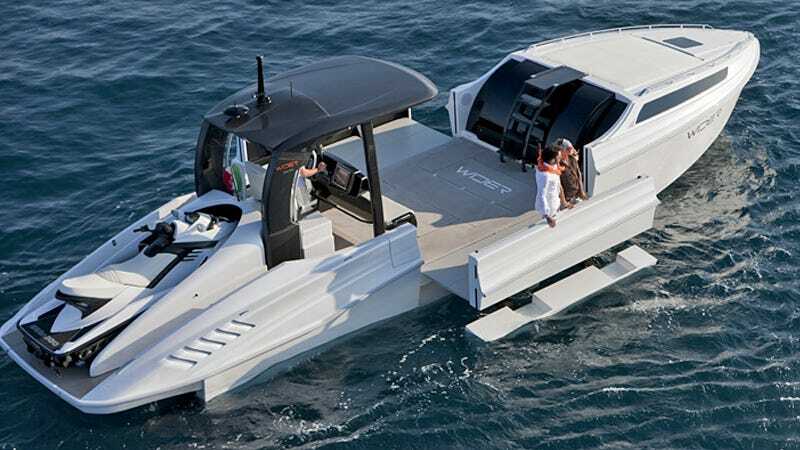 The craft seems more designed to serve as a floating patio and a home base for water activities, hence the dock and matching jetski perched on its stern.